Wash & cut Brussels sprouts into quarters, and dice onions. Mix in a bowl. Add enough olive oil to coat all veggies. Add maple syrup and mix. Add salt & pepper to taste. Add dried sage & mix. Lay out veggies on a baking sheet. Cut sweet potatoes and mix in bowl with a little olive oil to coat each bite. Spread veggies on a separate baking sheet. You could put all veggies on a large baking sheet. However, if one set is done before the other, its easiest to remove one of the baking sheets rather than remove some of the veggies from a shared baking sheet… just an option. Put both veggie baking sheets in the oven for about 25-35 minutes or until you see some dark coloring on the Brussels sprouts. While veggies are roasting, cook the Tolerant Foods Red Lentil Penne Pasta according to instructions on box. Strain pasta, saving 1/8 cup of starchy pasta water for pasta dish. Keep an eye on veggies. 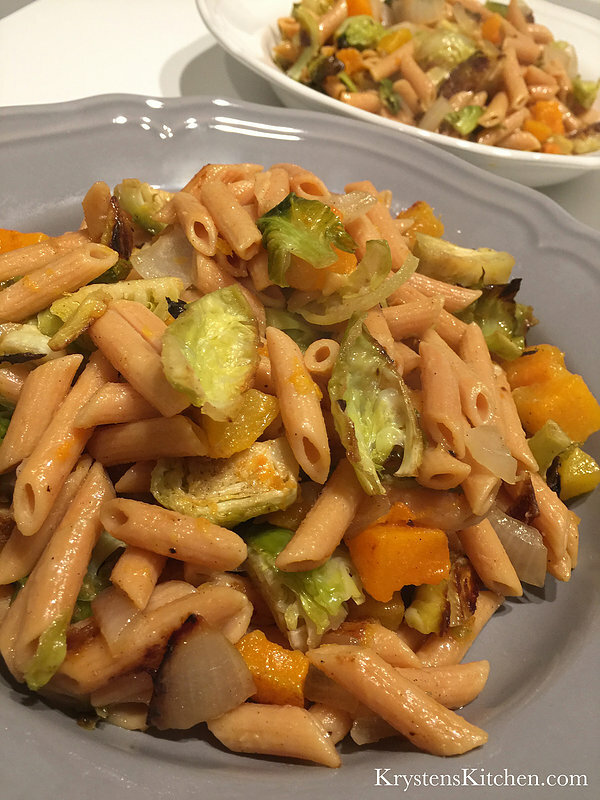 Pour drained pasta back into the cooking pot, on medium – low heat, add your starchy pasta water, roasted veggies and stir. Taste and add more sea salt and pepper to taste. Once pasta water has evaporated, which will be quick, your pasta is ready to eat. Serve in large bowl and be prepared for no leftovers.